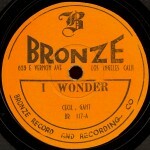 The independent Bronze Recording Company has been founded 1939 from John Levy and then acquired from Leroy Hurte, a former singer of the vocal ensemble The Four Blackbirds. The home office was at Hurtes recordstore at 623 East Vernon Avenue in Los Angeles. Bronze Records released Rhythm & Blues-, Jazz-, Blues- and Gospel-music. Hurte recorded two very influential R&B-songs of the 40's: Joe Liggins’ „The Honeydripper“ and Cecil Gants „I Wonder“ (1944), one of the first post-WWII Blues-hits. 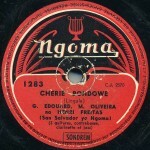 The label existed until the end of the 40s. 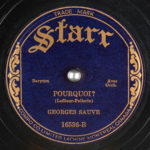 Leroy Hurte's Bronze-label was onn of the independent label, which developed on the west-coast besides Melodisc (Daniel O'Brien), the Modern-Label of Joe, Jules and Saul Bihari, as well as Philo Records (Ed & Leo Mesner).